Recycling is an exciting concept since it not only refers to the recycling of a product/resource more than once but it also refers to the recycling of waste and by-products for functional and/or practical purposes. Water, for example, can be recycled throughout the house and the garden over again. A domestic sewage treatment plant allows black and grey water to be recycled for further use in the garden, to top up a swimming pool, or channelled back into the cistern of a toilet. Bath water can be recycled into the garden to irrigate the plants ( .. and assuming you use biodegradable products … which is a simple purchasing habit to get into if you are not already doing it ..). Biodiesel, for example, is a vegetable oiled-based fuel that is produced from recycled cooking oil (although it can also be made from canola or soy oil) and used to run specific models of diesel engines – cars, busses, generators, etc. It is biodegradable and non-toxic and produces roughly sixty to seventy percent less carbon emissions. 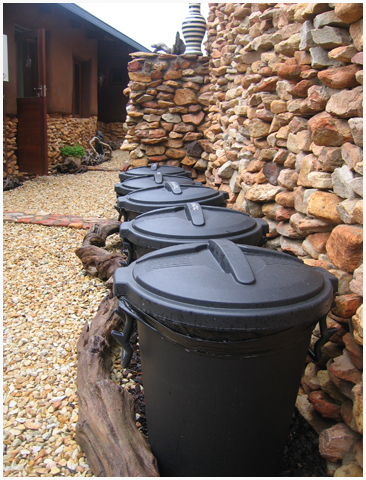 Rain water can be collected off roofs and stored in rain water tanks. This serves to reduce the amount of water provided by the municipality and therefore reduces the pressure placed on national rivers, dams etc. It also has the added benefit of reducing the monthly household water costs. One of the easiest things to recycle is all the organic waste from the kitchen. For those who have herb and vegetable gardens it is easy to set up a compost heap and throw the organic matter into the compost and have free, hands on compost for your garden. For those who do not have a large garden /herb and vegetable gardens organic matter can easily be thrown into a small worm farm that can be set up outside and takes up very little space, especially those worm farms that come in tiers. There is abundant information on setting up an easy-to-use worm farm on the internet. A worm farm is not always practical but it has the function of easily and neatly turning your organic leftovers into excellent compost for your garden.